Don’t eat this with that. It gets so confusing, don’t you think? But when you understand the basic formula for weight loss, you’ll never be at the mercy of the diet companies again. When it comes to weight loss, a calorie is simply a measurement of energy. When you eat a large apple, you’re taking IN 100 calories. When you eat 3 ounces of chicken you’re taking IN about 140 calories. So, I want you to think of the food you eat as CALORIES IN. When it comes to your body and the energy it uses, I want you think of that as calories OUT. You’re burning and using up that energy just like a car burns gasoline or like wood burning in a fireplace. Your body is constantly burning calories for energy – even when you’re sleeping. Everything that your body does to stay alive burns energy. So, that’s your calories OUT. Which brings us to a very basic weight loss concept: When healthy, non-pregnant adults eat more calories than their body can use, their body will store those extra calories as fat. When it comes to fat loss, you want to create a negative energy balance — also known as a calorie deficit. When you create a negative calorie balance/calorie deficit, your body will burn your stored fat for energy. For example, if you eat 2300 calories (calories in) but burn only 2000 calories (calories out), you create a positive energy balance of 300 calories. Do that every day and you’ll gain around 1lb every 12 days. But, if you eat 1700 calories a day and burn 2000 calories a day, you create a negative calorie balance (-300). Do that every day and you’ll lose 1lb in about 12 days. Your body is complex, no doubt about it. And there’s a lot going on as you move, sleep, digest and exercise throughout the day. Your body is busy repairing cells, building muscle and, well, just keeping you alive. Your body will do different things with the different types of calories you eat, too. But I don’t want you to lose sight of this very basic fact: if you eat more calories than your body can use, it will store the extra calories as fat. You can eat the healthiest foods, but if you take in more calories than your body needs, you will gain weight. What you want to do to lose weight is to choose a daily calorie goal that will create a safe and healthy calorie deficit for you. This is done using a formula that calculates the amount of calories your body burns in a day and then subtracting a certain amount of calories. But don’t worry! I have a calorie deficit calculator you can use, so you won’t be doing any math. This daily calorie goal is different for everybody and it’s a goal that will change over time. But you need start somewhere and then adjust as time goes on. Before we get to the calorie deficit calculator there’s an important point I want to make. When it comes to creating a calorie deficit and setting a daily calorie goal, don’t go too low. This is critical. Your body needs a certain amount of calories to function properly. Women should eat at least 1200 calories or more a day; men should eat at least 1800 calories or more a day. 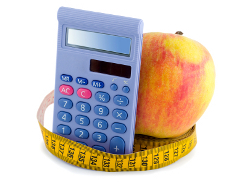 You can use the the FitWatch Calorie Deficit Calculator to create your own daily calorie goal. If you have a FitWatch Calorie Tracker account, you can set your daily calorie goal in the tracker. What you’ll do is select your gender and then type in your weight, height, age and your activity level. When you click the “Calculate” button, the calculator will give you a few different calorie deficit goals. For the average person, I recommend a calorie deficit of 15% to 20%. That’s a moderate calorie deficit. You can round the number up or down, if you’d like. So, if you see something like 1785, you can round it up to 1800 or down to 1750. Here’s a quick example. For a woman who is 200lbs, five feet five inches tall, 35 years old and lightly active, the estimated amount of calories her body burns in a day is almost 2300 calories. In order for her to create a moderate calorie deficit to lose weight, she could eat anywhere from 1800 to 1900 calories a day. Now you know the basics of calories in vs. calories out. Create a daily calorie deficit goal that’s right for you to lose weight at a steady — and safe — pace and never be at the mercy of a fad diet again. Just a quick side note: With this article, I wanted to explain the basic concept of creating a calorie deficit. There’s more to calories than just in/out. Quality of food and other factors come into play. But knowing the basic concept can go a long way to helping you understand weight loss.